‘That a complaint is not automatically referred to an employees’ line manager. ….So their line manager may be unaware of the complaint. (as, according to the records , when Ms Beazley ‘organised’ the complaint against her, without referring it to her line manager. ).’ This is not correct. Complaints about staff are generally referred to line managers for resolution in the first instance. Where a complaint is about the Head of the Review Team, an external reviewer will usually be appointed to conduct the review of that complaint, who will report back to a senior member of staff independent to the Review Team. Any learning from such a review would be shared with the Head of the Review Team’s line manager. I understand that you are Ms. Beazley’s line manager and therefore I am writing to you to inquire about the progress of my formal complaint. I am concerned that Ms. Beazley has, once again, taken a view regarding this complaint and decided for herself that there is no case to answer without any external reviewer or line manager involvement. There is much talk in the press of MPs ‘marking their own homework’ with the suggestion that having the opportunity to do so would only lead to scandal. Scandal of course is not wrong-doing but the public exposure of wrong-doing. Perhaps PHSO are happy to allow staff members to ‘mark their own homework’ on the basis that this will not become open to public scrutiny. As you may be aware I manage the phsothefacts.com website which has in the last nine months received over 10,000 hits. We are not reliant on main media now that many of us have access to social media and although it may not become the next Maria Miller scandal I can assure you that if PHSO continue to breach their own policy in regard to my complaint I will do my utmost to bring public attention to your maladministration. Hollow words, you might be thinking, but I am sure that Maria Miller thought she had ‘got away with it’ as her wrong-doing was some time in the past. Events have a way of catching up with you and our campaign is now reaching larger audiences through recent exposure on Scriptonite scriptonitedaily.com/corrupt-by-design-grassroots-campaign-say-32m-a-year-govt-watchdog-has-no-teeth/ and on the Socialist Health Association Website sochealth health-service-ombudsman-knight-shining-armour People are taking us seriously and I suggest you do the same. Let me explain the reason for my concern. On 27.3.14 I received a DPA submission from PHSO which contained a case history list with the last recorded date of 14.2.14. There is no indication in this case history, or within the documentation received that my formal complaint regarding Ms. Beazley and Mr. Comber went to either an external reviewer or to you as line manager. There were however, statements from both Ms. Beazley and Mr. Comber showing that they had reviewed the evidence and to a certain extent the complaint regarding service delivery. Marking their own homework. Starting with Ms. Beazley’s account, she had a great deal of difficulty seeing the wood for the trees. She continually missed the main point and focused instead on a minor issue which could be explained away. This is such a common occurrence among members of the PHSO Pressure Group that I wonder if it is not part of an established procedure. Ms. Beazley is certain adept at confusing issues, examples of which are too numerous to mention in full. Apparently she was not aware I had made a service complaint when she ‘took a view’ not to respond to my correspondence and she also muddled the failure of OCR to review the internal verification process with PHSO’s review of the decision process. Perhaps she was a little tired that day. She was certainly in a hurry to complete the task as her report was written the same day she received my correspondence. Although I value being prioritised, I do wonder whether she gave herself enough time to review the new material alongside the old. Ms. Beazley and Mr. Comber both dismissed legal advice from a specialist barrister as ‘mere subjective opinion’. Ms. Beazley says in her report HI-0139 that the review ‘looked at the legal advice and concluded it was not relevant to our decision.’ Can you tell me what legal qualifications either of these staff members have to pass such judgement on expert opinion? At no point was this matter sent for external review and no alternative legal advice was requested. Whilst all of my evidence is ‘subjective’ a well-used word from Ombudsman staff, their unqualified legal opinion is considered both valid and ‘objective’. That would appear to be applying bias. Ms. Beazley also states that I am just disagreeing with their opinion without any supporting evidence. Well, look in my case file and you will see that I have sent reams of supporting evidence all unfortunately deemed ‘irrelevant’ by Ms. Beazley and Mr. Comber. I could send you a signed confession from the CEO of Ofqual saying they committed maladministration and still it would be dismissed as ‘mere opinion’ and not ‘substantive’. It’s the way you work. Now to Mr. Comber who is very confused over the role of Ofqual. Perhaps he has not done the homework and looked at their policy statements, or perhaps he is overworked as I know you only have 8 reviewers in the team (not nearly enough) or maybe he just doesn’t want to see the truth of the matter. Who knows. For clarity let me confirm the role of Ofqual from their own lips. So from this we can deduce that Ofqual moderate awarding body compliance with the NVQ Code of Practice and in case there is any doubt on that matter here is a quote from their own ‘Policy for conducting enquiries into complaints about awarding organisations and qualifications’ (2010). Among the relevant regulations listed is, ‘NVQ Code of Practice 2006’. The barrister identified 3 breaches in the NVQ Code of Practice all of which were notified to Ofqual. Ofqual took no action saying that OCR had handled my complaint correctly, when they failed to handle my complaint at all as they refused to investigate any of these breaches. According to Ms. Beazley and Mr. Comber, identified breaches and lack of compliance to the code of practice is irrelevant and apparently outside Ofqual’s remit. The requirement to provide an individual assessment plan for each student is recorded in the NVQ Code of Practice, the external verifier manual for OCR and the Quality Assurance Report completed by OCR on inspection of the Helen Arkell Dyslexia Centre. (All previously supplied) We can be fairly sure therefore that it is a requirement of the relevant regulation to provide an individual assessment plan. None was provided, a clear breach of procedure. Well not if you are Mr. Comber. Although the complaint to PHSO concerns Ofqual’s maladministration, Mr. Comber decides to agree with the disputed body that ‘…Ofqual had deemed her complaint about her assessment plan a teaching function and so not a matter for them. We saw no reason to disagree with Ofqual’s view…’ It is not within Ofqual’s power to deem that the assessment plan was not a matter for them. It is cited in the NVQ Code of Practice and is therefore part of a statutory responsibility. All organisations must operate within the law. Rather than agree, it was PHSO’s responsibility to investigate the matter. So when it is confirmed from OCR themselves (evidence supplied) that they did not investigate the IV process this would appear to be a clear breach of statutory policy and procedure. Well not if you are Mr. Comber who converts ‘duty’ into ‘obliged’ then omits to comment on the failure of OCR to meet either their duty or obligation with an investigation. Instead he concludes that, ‘I can see no inconsistency between their [Ofqual] saying on the one hand that they cannot determine whether malpractice has occurred and on the other that the allegations do not meet the definition of malpractice. ‘ Well I can. If they cannot determine whether malpractice has occurred then how do they know that the allegations do not meet the definition of malpractice? In any respect Ofqual have made it clear to OCR that they have a ‘duty to investigate’ and OCR failed to comply with that duty. This new evidence of clear breach of policy was considered irrelevant by Mr. Comber. I am beginning to feel like Winston Smith in the scene from 1984 where his oppressor holds up three fingers and refuses to accept an answer until Winston says he can see four. They both know there are only three fingers showing, they both know the truth. Mr. Comber, Ms Beazley and you must know the truth of this matter; a nincompoop could discern the facts, provided they were an honest nincompoop. According to the Case History the ‘Executive Office wish to respond’ to my complaint and new evidence, but in line with your usual practice I have received no response as none of my evidence has been accepted as either new or relevant. I have also received no response regarding my substantial service complaint of Ms. Beazley and Mr. Comber. Can you tell me when I am likely to receive that response and whether any of this has been handled by an external reviewer as requested? I look forward to your reply even though I know from experience that the chance of receiving a reply is very small. Very, very small. Teeny tiny in fact. Miniscule. Even if you were to reply you would only agree that both staff members have acted appropriately. You too would say you can see four fingers when in fact there are only three. What else can you do? It would take an act of suicidal bravery to do the ‘right thing’. I am not expecting that. I am not expecting anything but more of the same. PHSO are at least consistent in the way they manipulate and deny evidence to protect public bodies. It is clear to me and members of the Pressure Group that this is your primary objective. P.S. Your rubber stamp letter arrived today as predicted, which saved me the cost of posting this letter. Straight online with a link to you. Previous Previous post: How to navigate the PHSO complaint system – be prepared for the long haul. Next Next post: Injustice is a bitter pill to swallow. There are many similarities between this account and my own experience dealing with Ofqual and their support for an awarding body over that of an assessor who raised a concern they thought might be legitimate. 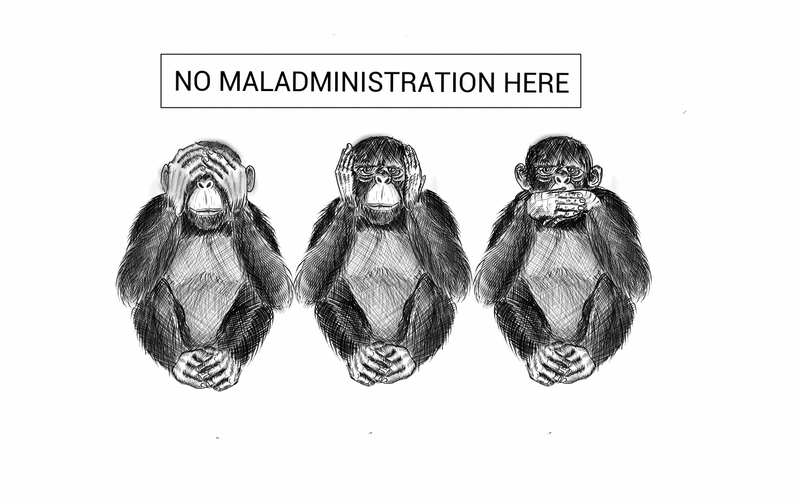 In my complaint the Ombudsman found some maladministration and partly upheld my complaint. However one of the points they missed was that an Ofqual Officer (John Skipworth), claimed to have given Edexcel insufficient advice thinking that I had offered to surrender a qualification when instead Edexcel had invalidated it. He claimed to have been confused by Edexcel’s use of cancel and had expected them to say invalidated. Saying that the use of cancel meant it was being done at my request. Mr Skipworth cited a letter from Ofqual as evidence of this, that letter stated “[…] gives us no option but to cancel your A1 award […]”. I tried to point out that “gives us no option” clearly shows that it was an action being done by Edexcel and not at my behest. This was consistently missed by all staff at the Ombudsman. In regard to your concerns about the assessment plans, as a suggestion, have you tried contacting the funding bodies – they have a set of requirements and can audit an NVQ centre to see if the assessment plans are being completed to a proper standard. PHSO have a logic all of their own. Breaches in the law – what breaches in the law, we didn’t see any breaches in the law. So who are the ‘funding bodies’? I may give them a try. So the Head of Review (HOR) doesn’t make mistakes and, despite a lack of legal training, is empowered to close cases? My case was closed by the HOR when she made the decision that the Information Commissioner’s Office was correct in NOT providing me with medical records. (No surprise there – The ICO and PHSO seem to be into mutual rubber-stamping on Decisions). 1. I hadn’t asked the ICO to produce any medical records. 2. I had asked for the internal files of a hospital trust – under the Freedom of Information Act (FOIA). These files showed HOW badly the NHS investigated my complaint, before it was upheld by the Welsh Ombudsman. You may well ask how can ANYONE dealing with NHS complaints – on a consistent basis – believe that the ICO provides medical files under FOIA? …Let alone a Head of Review. ‘The review team failed to provide Mrs TO with a reasonable or acceptable level of service. The service actually provided was, in my view, well below the level you would consider adequate. Some of the decisions at particular points were unreasonable; there was a failure to co ordinate the review team’s work with the efforts being made by the FoI team; and the review team seems to have become ‘locked’ into a negative bureaucratic process, which it treated as unalterable, of refusing to consider the points made for review. As a result of those failings, it is not at all surprising that the team’s responses would have come across as curt and peremptory, while failing to respond to the issues being raised. It is also clear that a substantial avoidable delay resulted. I can it say what the result would gave been if one had been launched in November 2012, as it should have been, but whatever it’s outcome a good deal of delay would have been avoided…..
…It is not evident from the papers that I have seen that the PHSO has a robust system to dealing quickly where complaints are made about the review team itself’. So to anyone who thinks that the Head of Review’s word is final.. Take heart. Your case may be locked in a ‘negative bureaucratic process’ , where the Head of Review consistently refuses to consider the evidence too. The key is to find the overlooked evidence that you presented in the first instance. ..there’s probably plenty. To do this you have to ask for a SAR ..the PHSO internal files in which you are mentioned. And marvel at what has been misread and missed. If there is no logic present for how the PHSO made the decision, you may well wish to return to the FOIA department and state that it is missing. As I did. Because, at first, the PHSO WITHELD the very file on which the HOR made her incorrect decision. Mistake or a deliberate act? You decide. But even having obtained the evidence that the case was botched and you point out what is wrong with this decision in simple terms, the HOR might say ‘no new evidence’ and consistently try to close the case. This will be a familiar pattern to anyone who has taken their case to the review team. For apparently the HOR is so self-confident in her decisions, that she sees no need to bother reading your summary of where it went wrong and ….review the review. So don’t be rebuffed by a ‘curt and peremptory’ refusal by the HOR to review your complaint, as the external investigator so accurately described this arrogance so prevalent within the PHSO. Ask for your complaint to be referred to an external investigator. My external investigator, who was legally trained, took the bold step of reading …and understanding …the complaint. Thus his sensible and informed decision. Time taken for me to get the PHSO to grasp the central point of the complaint? ….Over a year. An apology from Dame Julie Mellor and £500, with a following investigation of the complaint. How much bother it would have saved everyone ( and public money) if the complaint had been reviewed carefully in the first place.